For the second year in a row, INTI International College Penang (INTI Penang) was selected as a grant recipient by Motorola Solutions Foundation, the charitable arm of Motorola Solutions. The grant, a monetary award of USD 35,000.00, is offered in support of programmes which advance science, technology, engineering and math (STEM) education and aims to groom the next generation of innovators. 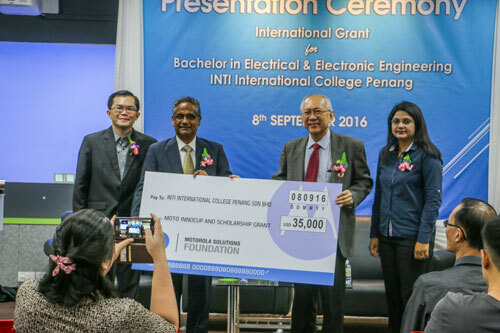 Sharing this vision, INTI awarded the bulk of the grant as scholarships to four students from its Bachelor of Electrical & Electronic Engineering programme. The recipients are Lee Gang Ying, Goh Zhe Qian, Tan Chee Wei and Yogendran Rajaretnam – all of whom have demonstrated a strong academic standing with a CGPA of above 3.25, strong leadership capabilities, as well as active participation in both classroom and extracurricular activities. Beyond the monetary award, the grant also paves the way for these young hopefuls in securing potential future employment with international organisations. To support and encourage more students in gaining these hands on experiences, the remainder of the grant has been set aside to fund the annual Moto Innocup, an inter-varsity software competition sponsored by Motorola Solutions Foundation and organised by INTI; and the Robotics Challenge, another collaboration between INTI and the Motorola Solutions Foundation for secondary school students. INTI’s continuous collaboration with more than 400 industry leaders from across the country provides students with platforms to develop their knowledge, skills and leadership capabilities, opening up opportunities for them to work alongside local and international organisations while still studying.